Access to the claims staff of leading insurance companies just got a little easier. 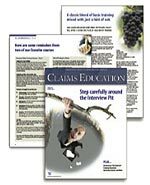 Introducing Claims Education Magazine® - a magazine created to further educate professionals who have proven commitment to succeeding in the insurance industry. Published by International Insurance Institute SM (III), the industry's leading trainer, Claims Education Magazine will give all levels of claim adjuster and managers techniques for improving skills and meeting challenges they face every day. As part of our continued success, we are pleased to announce that Claims Magazine, owned by The National Underwriter Company, is partnering with us in the publication and distribution of Claims Education Magazine. It's a huge opportunity for claim professionals and an even bigger opportunity for you. When you advertise in Claims Education Magazine you access International Insurance Institute's exclusive database of claims adjusters and managers who have attended courses to improve their knowledge and skills, as well as Claims Magazine's 15,000 subscribers, made up of insurance company and independent claim executives, managers and adjusters. You'll reach 24,000 claim professionals through the customer databases of both organizations. This is a very attentive audience that represents immense buying power. Each quarter, Claims Education Magazine will provide its readers with a resource of news, insights and the latest training techniques available for the claims professional. Every issue will be filled with skills taught in the classroom and proven in real life. The magazine will also recognize the achievements and accomplishments of professionals in the field, from entry-level customer service reps to the highest levels of claims and insurance management. A powerful environment for your ad message! Sponsor marketing opportunities to network and distribute materials at III training sessions ($1,950 value). Bonus distribution at the 2007 Claims Education Conference, May 15-18, 2007 ($1,000 value). Sponsor listing on III website receives exposure to more than 100 insurance companies in III's global education network ($750 value). Per page rate is $5,000 net which includes a comprehensive value ad program in print, in person and online. Contract for the next four quarterly issues of Claims Education Magazine and receive an additional 15% savings of $3,000 or $750 per issue. All rates are net. All ads are 4-color. Full page ad trim size: 7-7/8" x 10-7/8"
Full page ad bleed size: 8-1/8" x 11-1/8"
We use the following programs: Quark Xpress 6.5, Illustrator CS, Photoshop 7.0, InDesign CS2. Advertising material not meeting the specifications outlined above and requiring additional preparation work will be billed for the work performed. Carl Van is president and chief executive officer of International Insurance Institute, Inc., which specializes in delivering on-site claims training to insurance companies across the country.